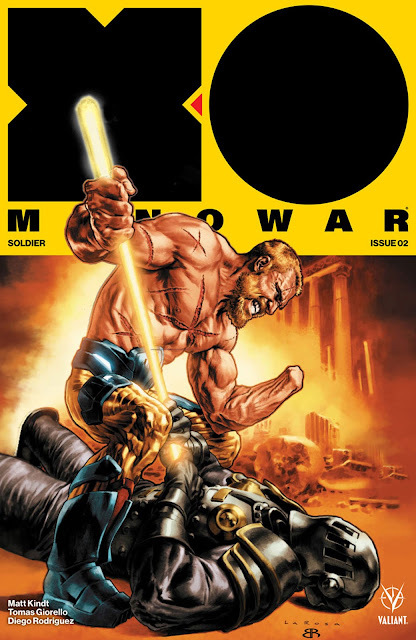 It may be spring but Valiant is bringing us a red-hot summer blockbuster in 'X-O Manowar' from Matt Kindt and Tomas Giorello. Issue one blew off the doors at comic shops with over 90,000 sold. That's unheard of for an independent publisher but 'X-O Manowar' is worth every bit of hype who've heard and more. Movie studios put together these gigantic tentpole films that usually consist of over-the-top action full of explosions and elaborate stunts. Comic book readers, however, don't have to wait for the next movie to premier when 'X-O Manowar' is available right now and it's chockful of action, adventure, and gasp-inducing stunts. Aric of Dacia has been forced into combat leading a small team to destroy Cadmium's defenses. They'll have to go through an impossible gauntlet of obstacles to get there. This epic space adventure is a cross between 'Flash Gordon,' 'Die Hard,' and 'Lord of the Rings.' It's a fast-paced adrenaline rush with jaw-dropping visuals and action. Normally, Aric would get by as an overpowered hero with his living suit of armor. Not this time. He's reduced to adapting his X-O Manowar armor to a ring and has to rely on his smarts and sheer cunning. It's one of the few times I can remember audibly cheering for the hero in a comic book. Kindt's narrative is straightforward and unyielding. Just hang on and enjoy the ride. None of this would be as epic were it not for Giorello's pencils and Diego Rodriguez's colors. Giorello invokes memories of fantasy master artists Boris Vallejo and Frank Frazetta. The combination of fantastic landscapes in a sci-fi setting is seamless and completely immersive. The fight sequences are paced for maximum impact and for all its explosive moments, Giorello is skilled enough to know when to let a scene breathe. Rodriguez's palette of dark colors and occasional splashes of green and yellow enliven Giorello's pencils creating a magical yet gritty look. 'X-O Manowar' is the sure-fire hit of the year that has established itself after only two issues as the blockbuster event comic to beat. If you like non-stop action, incredible art, and a kickass space adventure this is the comic you've been waiting for. Valiant has set the bar for high-octane storytelling.